Hello and a very happy shiny New Year to you! I'm a little late to the party I know but, to be perfectly honest, it's taken me a while to get back into any sort of rhythm after the festive break. My sleeping pattern seems to have gone totally to pot over the last week or so and I've been waking up at 3am each morning with a manically busy mind. I really need an uninterrupted eight hours every night or I get ever so discombobulated. ❤️ 100g skein of hand-dyed alpaca/merino/silk in dk weight (approximately 210 metres). ❤️ Sunshine & Bloom colouring book for grown ups. ❤️ Cath Kidston notepad and pencils. ❤️ Cath Kidston pencil/notions case. ❤️ Cath Kidston pocket mirror. I will also be including a couple of other surprise bits. If you fancy the chance of winning this parcel of loveliness, what I should like you to do is simply leave a comment on this post, citing one absolutely lovely thing about January. Let's share a bit of joy with each other. Ooh, please also include your email address or Facebook/Instagram name if you are a 'no reply commenter' so that I can get hold of you. That's it. It's open to anyone, anywhere in the world. You have until 5pm GMT on Friday 15th January 2016. Edited to add : I'm so enjoying reading your comments, thank you! I forgot to mention that I will wind the skein into a ball for the winner if they'd prefer. 15/01/16 17:00 GMT : Entries are now closed. Result announced shortly! I love January for snuggling indoors with a hot cup of cocoa, an open fire and some crochet, listening to the wind and rain on the windows. What a lovely Giveaway, thank you! One nice thing about January is having a whole new year to look forward to. Thank you for the chance to win all the way from down under in Australia. I love January because it is Summer school holidays down here. I am a fulltime teacher but would dearly love to be a fulltime dollmaker. This month off has given me the chance to spend on making sweet little people for sweet little people! I love January, New beginnings, logs fires, crochet, fluffy blankets, and long walks with the dogs. I love starting our home education school year off with a new topic - this term? Doctor Who based lessons with every subject covered and plenty of chances to watch past episodes. Such lovely gifts! This is very generous of you. I am also enjoying getting back to a more normal routine, crocheting whatever I fancy trying, and snuggling under warm blankets as the cold days slowly pass. I hate taking down the decorations and lights, so in January I love to go out and buy bits and bobs for the lounge to fill the void. This January I have bought some all year round fairy lights, candle holders and some yarn to crochet a comfy throw. I love January because it gives me the perfect excuse to do such things! Gorgeous items! One great thing about January is the days continue to get longer as the month progresses - spring gets that much closer! Hello, my absolutely lovely thing or things about January is that I can make lovely pretty fibery things for myself! What an absolutely lovely giveaway too! Ooh this looks so nice! Happy new year to you as well! What a lovely giveaway you have here, I'd like to give it a shot :-). January is the month in which I have my birthday, that brightens up this sometimes dark month! You'll find me on Instagram under judithswinkels. All the best from the Netherlands! Happy new year Heather and thanks for hosting a fabulous giveaway! I love the end of January here in Australia when I return to teaching as I get to meet my new students and also catch up with my previous students to hear about their summer holiday adventures. It's super lovely! I love the beginning of January because it's mean a new year starts with good things to look forward to. Also means I only have 9-10 months to wait before I get to see my family in the Uk. Even though it's hot here in Perth Australia I Stil get to knit. I love Cath Kidston items. Good luck to everyone. Happy New Year! I love that yarn. So perfect for the spring! Wow such a lovely giveaway and your wool looks beautiful such lovely colours.january means a new beginning to look forward to the year ahead.I love January as snowdrops start to bloom they weren't Morhers favourite flower and when she passes away last year we gave everyone who came to show their respect some snowdrop bulbs so they will all be thinking about her in January. Thanks for the chance to win this lovely giveaway. January for me is invigorating. People are all about fresh starts, new planners, new health initiatives. I think it's fun and inspiring. Happy new year lovely giveaway :) January is the month of being able to slow down and enjoy after all the hectic events of christmas and new year :) Instgram craftystashbuster. The best thing about January.. it is the month I became a mom! And then my youngest was born in the same month. Love your blog! jsbegley@neo.rr.com or Renate Begley on facebook. Happy new year, it was 43 degrees c here today, so a lovely thing about January on days like these is getting to swim in the pool and cool down. I'm looking forward to a year of new crochet projects! What a lovely way to start the year. What I really, really like about January is all the blank spaces in a brand new diary or calendar just full of possibility. What a lovely giveaway. It is absolutely lovely to know that there is a teensy bit extra daylight each day in January. What an absolutely beautiful little package. It is often dark and dreary in my part of the world in January but I have decided this year that rather than complain about it I am going to embrace it.....spending the evenings cuddled on the couch crocheting, working on my summer vacation scrapbook....just embracing the season. And you know what, I kind of love it. What a lovely bundle of joy! There are several things I love about January: it's my birthday next week (although not particularly happy about the '30' part - eeek! ), I love snuggling under a blanket I am crocheting on the cold dark nights, but my favourite thing about January is the anticipation of what the next 12 months will bring! January is a fresh start. I always think of January as a freshly made bed, crisp, clean and just waiting for us to rumple the covers. Today the sky is so blue. January is a great month Your giveaway yarn reminds me of the colors of January. They are there bright and cheery, just toned down by the white of the snow. Happy New Year! What I love about january are the new challenges of the new year. This year I decided I would learn to knit and that by the end of the year I will have made a pair of socks! Last year's challenge was to learn to crochet! the year before was to sew! What a lovely thing to do for January. Why I love January - new beginings, fresh starts, the promises of longer days. January for me is the anticipation that any new year brings, new beginnings, new dreams and plans and countles new crochet projects and skills to learn. The beauty of the crisp frosty morinings, the snuggling under you lastest make with a hot chocolate in front of an open fire. I love the freshness of January--the Christmas clutter removed (although I love it during December!) leaves such a clean, fresh slate. I love January now because of this giveaway - yah !!! What a lovely giveaway. If I was lucky enough to win I would give the wool my to mother-in-law. She will be eighty, yes 80, tomorrow, so that is our happy thing for January. She finally learnt how to crochet last Summer and loves it. She is like a teenager again - so excited at learning something new and finding all the amazing yarns that are out there. She is like a kid in a sweetie shop! What a wonderful and exciting giveaway, not wonder there are so many comments. How wonderful! One absolutely lovely thing about January is that it's a perfect time for doing crochet and knitting one of the darker months of the year! January is the snug month! Thank you! Many best wishes for a healthy and content New Year. My favourite thoughts about January are the complete contrast to the (lovely but) chaotic and frenetic December / Festive celebrations. I love Christmas, but I really welcome the peaceful return to daily routine, simpler healthy foods, quiet cosy evenings, bracing daytime walks. I'm not one for making resolutions as I seem to start all my new beginnings in September. Instead, my aim at the beginning of January is just to breathe and regain normality. If I'm lucky enough to win the draw, please would you wind the skein into a ball as I don't have a winder (yet!)? what a lovely giveaway...all those spring-like colors!!! I must admit, I love winter....not for the snow (which we haven't had this year!!!!) but for the 'nesting' and the fires in the fireplace and cozying under all those afghans and blankets I've knit in years past. Thanks for the giveaway! I start thinking about my garden in January and begin to order and plant seeds. Thank-you! Such a lovely spot of colour for this time of year. I love that January is quiet. There is a peace in it that allows us to recharge and re-ground. It can be stark, but there is beauty to be seen in those watery sky colours and sharp silhouettes against them. I love the chance to decorate for a new holiday! Thanks for the chance to win :) Happy New Year! 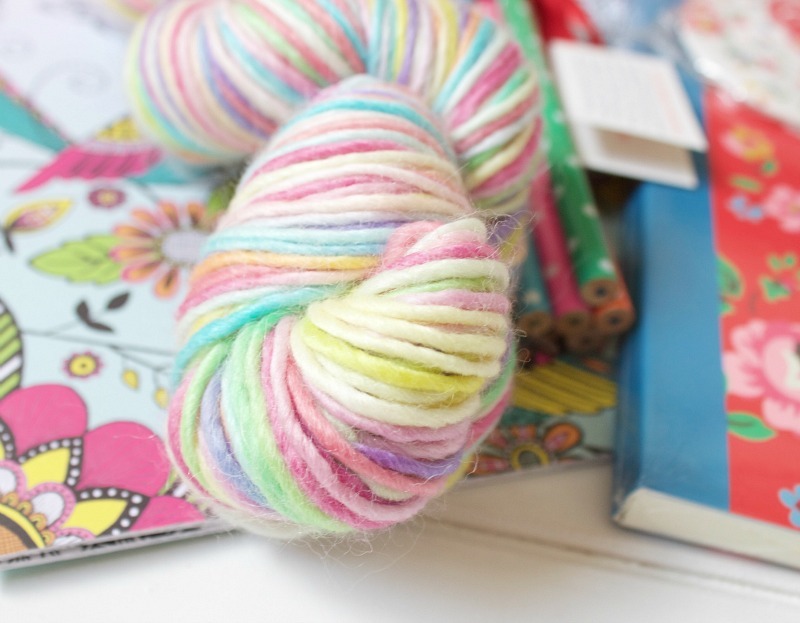 January nights with a hot cup of tea, a big blanket and a easy no-think crochet project are all very lovely! Coming home from work and lighting the candles, snuggling up with a warm blanket and starting a new stitchy project...bliss! Happy new year and all the best whishes to you all!! What I love about Januari is that my dads birthday is on the 23 of Januari and he is becomming 65 years old. A very good reason to celebrate! January can be a difficult month to love, but I think there is something nice about clearing away the Christmas decorations and seeing the house in (a very small amount of) order. 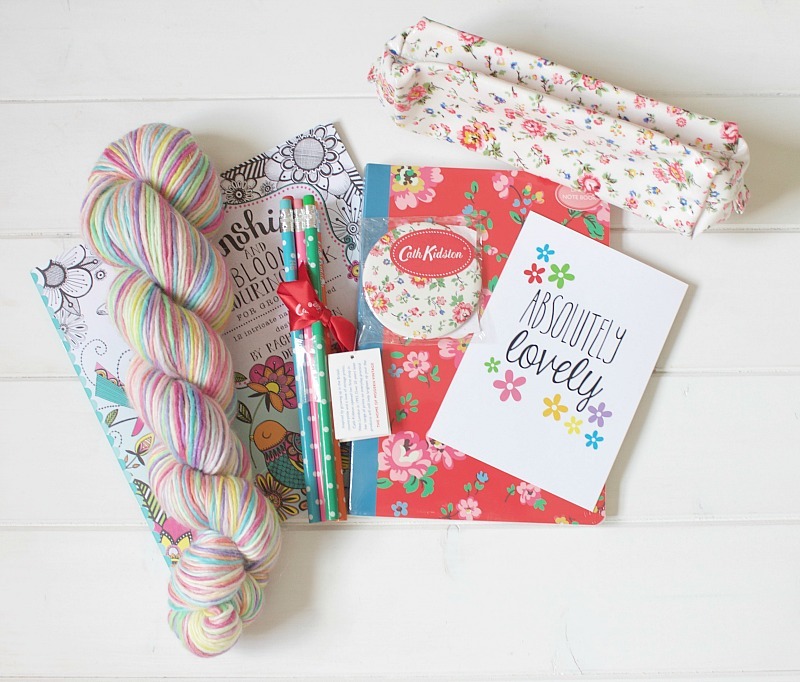 Oh my, yarn and Cath Kidston! Too good to pass up. This January is particularly wonderful as we have snow! So wonderful to read every ones positive comments. I work hard to relish January, I love the opportunity for reflecting, planning and newness. I love winter walks in the park and having time for long visits with my family. Oh, and snuggling under blankets! Your giveaway is lovely, what a nice bundle of goodies. I am so excited to find your blog! It is the exact kind of happy colorful place I like to visit so am adding you to my list! I came over from Instagram and am so glad I did! Happy New Year what a lovely giveaway! I love the anticipation of all things new that January brings. And a definite bonus was arriving on the supermarket car park this morning and getting a space without driving around dodging Christmas shoppers. Thanks a lot for this lovely giveaway! January is one of my favourite months. I do live its smell of blank journal with brand new pushed ready to be filled with dreams, projects and ideas. So Happy new year to everyone! You can find me in Facebook and Instagram as retalparacual ;). My favorite thing about January is the reality that all the hustle and bustle of the holidays is past. I can relax and enjoy the peace and quiet. (elizabethann271@gmail.com) ...that yarn is gorgeous!!!! The bitter cold of January in New England means I get to drink lots of tea and wear ALL the handknit/crocheted items! Much of our year here is too warm for large squishy shawls and such so I appreciate the short window of opportunity. Plus, the weather is perfect for making more large garments/items. Snuggling in with my family - and crazy dog - in front of the fireplace. Something about the warm fire and cozy setting lets my teenagers be snuggly kids again. I love January for that! 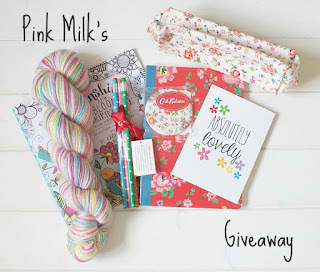 What a beautiful collection for your giveaway - just seeing the photo made me smile! There are some things to enjoy about January . . . and I've thought for about 5 minutes now and still can't get past my initial reply . . .which is - January is one month closer to warm weather! In winter, I just bide my time waiting for spring. :) tlynn737@aol.com Thank you! Thanks for the giveaway. I love the adorable yarn especially. I love January especially because its the month with my mom's birthday and I love the chance for her to have some fun! What I love about January is no orders so all my time is spent on lovely crochet, all for ME!!! This gorgeous lot would make me silly happy! What pretty things! What I love about January is the sense of optimism I get, watching shy little snowdrops pushing through the hard soil, the bulbs slowly waking and readying themselves. I dread January and then it comes and I realise I love it all over again! Happy New Year Heather. What a lovely and generous giveaway. I love January because there's a whole new twelve months ahead of us full of possibilities. It's a time for dreaming and making plans. What could be better. One thing I love about January is the snow we always have, some outdoor activity and then coming inside with a hot drink and some crochet or something and just feel the warmth returning to my body. Happy New Year Heather,and thanks for the beautiful give away.What do I like about January,well for one thing I made it....another year yay,my 68th.I love the early snowdrops and sometimes daffodils.The days are slowly getting longer.i don't have to out if I don't want to I can sit home with my hook.....bliss. Your Giveaway is wonderful like a dream ! What a lovely giveaway! This January I'm looking forward to beginning to make lots of soft furnishings for our new home. What a lovely giveaway, once all the decorations are down the house looks a little bare and I'm starting to think about decorating rooms and adding some colour too, so this January will see me spending cosy nights on the sofa being inspired on Pinterest. The sunrises in January are amazing at my house! I'm excited about the coloring book, I've wanted one since I first heard about them. January is lovely as it is the start of lots of new things ... New year, new resolutions, new goals, new calendar ... The list could go on! What a lovely way to start January. Sorry that your not sleeping well at the moment, there is nothing worst then waking during the night with your head whirling about :( does writing things down help you clear your mind ? Thank you for offering such a gorgeous and generous giveaway. I look forward to a new start in January and that includes dreaming up new crochet projects in spring colors, and the anticipation of spring bulbs divulging their colors. Something I love about January is that once the decorations are put away the house seems to be spacious and tidy (even if it's not), and I'm reminded of how much I love my home again. I must say that this is a very pretty giveaway indeed. Happy New Year! Happy New Year! My favorite thing about January is my sister's birthday on January 1st. What a lovely prize package with beautiful colours. I love the evenings getting lighter and planning adventures for the year ahead. January is like Monday, none of us are keen to welcome it but it can turn out to be great and a good starting place for what is yet to come. Ooh how absolutely lovely of you!!! Happy New Year! The best thing about January is all the lovely kinds of soup one can make to ward off the cold weather! Happy New Year Heather! Oh what a lovely giveaway!!! I'd love to participate! The best thing in January for me is that days are starting to be longer :) Greetings from Poland! Happy New Year to you. What I like about January is the blank canvas of the new year. 365 days of hope and anticipation of projects and adventures that are limitless in our imagination. A new book into which we can write our own special story. What a lovely bunch of gifts. Anyone would be pleased. One thing I like about January is that regardless of how it seems, the days start getting longer. My email is lrtnichols@nventure.com. I love how the frost on the grass in the dark of morning looks like fairy glitter! It makes having to go out and warm up my car a treat because of the peacefulness of the quiet morning, and the diamond sparkling of the frost. Winning this lovely package would be the most wonderful way to start 2016. There are 2 January babies in the family, isn't that just lovely? Thank you for yor kindness.... It would be so much fun to win! The best thing about January is looking over the past year, counting the blessings, and looking forward to a new year of memories! I have three little boys and so every day is new and exciting!! Waves and smiles from Georgia in the USA! January brings crisp mornings that capture your attention and evenings featuring wispy sunsets of bright pinks and purples. Thanks for your blog and for this chance to win some fabulous stuff! I luurvve January in Hong Kong ... not humid, not hot, not sticky, don't need two showers a day. In other words it's the perfect time for crocheting with that absolutely beautiful yarn and not need to have the air conditioner on to do it!! January, though not my favorite because of shorter days and colder weather, is also lovely because it IS, after all, the start of a NEW YEAR. A time for reflection on goals - both met and unmet. And for us to set goals (New Years Resolutions?) for the new year. A NEW BEGINNING. Time to learn from our past mistakes and start anew to correct them. In cold climates, it's usually beautiful and white - that white, perhaps. symbolic of a clean slate - for those new beginnings! 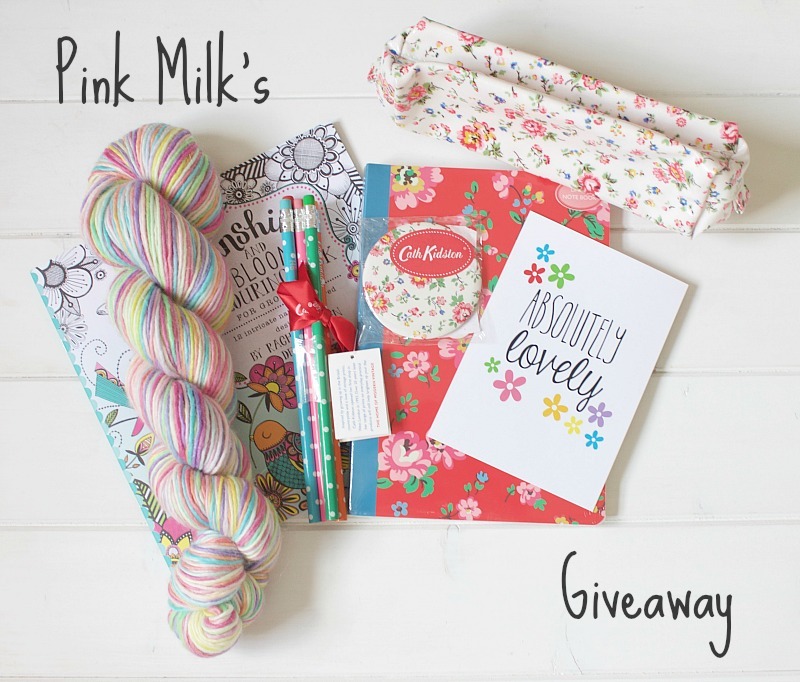 I'd love to win this lovely package of goodies...this yarn looks so soft and lovely! and such soft, lovely colors! Wishing you and all your readers a Wondrous New Year filled with Beauty, Blessings and Happiness! Since I'll be taking my first trip abroad this year, this year, 2016, will be filled with new joys for this older lady (70+). Also taking my first cruise this year, so it's going to be a whole new year filled with all new experiences. Why not? Might as well live this life to its fullest! As long as I Praise God with my life and try to stay in His graces, living a full life beats the alternative, right? I love the newness of the new year that January brings and fresh starts,also that it' feels the start of stepping towards the lighter nights that is soon to follow. It's my birthday in January also. Good morning such a pretty picture! Happy New Year!! January is my oldest sons birthday! Happy New Year! I like January best for the snow - that we actually have today :-) - the light that the snow gives, the fire and the candles lid inside, the muscari flowering on my table. We always have quite an active social life in January weekends - catching up upon the friends we failed to see for Christmas. I love that, too! Hi Heather January brings a reprise of last year and looking forward to all the good things happening during the new year. In my case two weddings and two 30th birthdays in the family for a start. Must start crocheting!! I love being warm at home while it's cold outside. January is the first month of the year and that's what make its the best for me. I do start something new this time of the year like this year I started my own crochet n knit blog. Also it's a month of celebration for us as many of our family members including my elder daughter celebrate their birthdays in this month. It's happy smiles everywhere for us. Wish you a fun filled new year and thanks a lot for giving us the chance to win this lovely giveaway. It's my birthday month! What could be more uplifting and my lovely kind husband takes me away for a mini break which includes wool and craft shops. Happy New Year to you all! The giveaway sounds great! January is a special month for me, as two of my seven children were born in January! The younger of the two, my daughter, is an amazing knitter, who LOVES Cath Kidston...! I would love to win your giveaway so that I can share it with my daughter! thank you! Beautiful giveaway it is - Enjoy feeding the birds with 4 feeders - so many different ones. Hi this is a lovely giveaway, what I love about January is the simplest thing the evenings start to get brighter, every evening there's another little stretch , giving you hope, and the buds start popping out, and spring flowers start to shoot up, endless possibilities to new hopes, dreams and the year ahead. My Facebook is Michelle O Driscoll with 2 boys sitting on footballs!! I love January. It's our slowest month of the year as the kids' activities slow down. It's time to relax and soak in everything around us. January is a chance for me to relax after the Christmas excitement, stay indoors and do crafty stuff and await the sight of the first early lambs in nearby fields. Love your blog Heather. I bought the first bunch of daffodils of the year. Love them! Also fairy lights. Fairy lights are for life not just for Christmas. Thanks for arranging the give-away. Such a lovely idea. I absolutely love January as it's the month my beautiful boys were born! And mine too. January is special to me because it is a chance at new beginnings. For me, this January is about reconnecting and making stronger connections in many ways. With one friend I am tackling clutter the Marie Kondo way- each of us in our homes in New Hampshire and Australia. With new friends I am taking part in a group sewing project to make lovely outfits for women coping with sickness or bereavement, and most exciting of all, I have found again a friend who is like a sister to me but who faded away in the busyness of life and my three moves. What an (absolutely) lovely idea! I've got to confess it's not my favourite month, but for me the highlight of January is on the last Tuesday when Shetland celebrates Up Helly Aa and those of us who no longer live there can watch the webcast of the torchlit procession. I usually go over to my brother's flat, we get a takeaway and watch the webcast and reminisce. In a cold dark month it's the highlight! Also on the cards this year is a trip through to Edinburgh to see the Turner in January exhibition - more light in the darkness :-). The New Year is a chance to wipe the slate clean and start anew! Hi Heather! I would be ever so happy to be the proud owner of some Cath Kidston beauties! If I ever made it to the UK I think I might buy the store! Have a Happy New Year! What a pretty bundle,my favourite part of January is waiting to see the Snowdrops! I love the idea of a fresh slate to fill,an empty diary,tulips in the shops,early lambs in the field behind my Dad's house and my wedding anniversary. That is a very pretty prize. My Instagram name is cinders74.nn. Thanks and a very happy new year to all! January always feels like a fresh start with the New Year. Time to regroup and move ahead!